Date: September 5th & 6th, 2009. 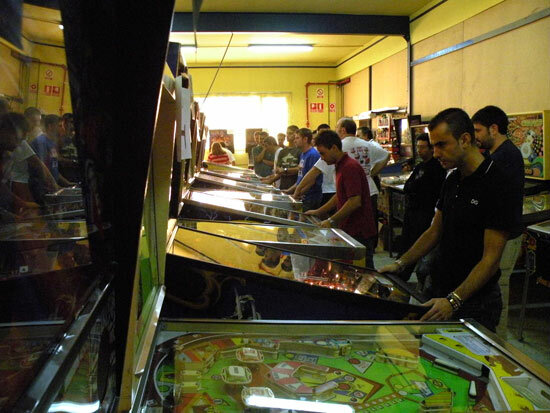 The first weekend of September saw the celebration of this year's edition of TEP (Torneo Español de Pinball / Spanish Pinball Tournament). This was the 9th edition and set a new record for the event: we achieved a total of 43 players. Signing up for the TEP gives you the right to participate in two tournaments: Classics and Main. The Classics tourney has a special significance for Spaniards, as most (if not all) of the pins for this category were made by Spanish manufacturers. 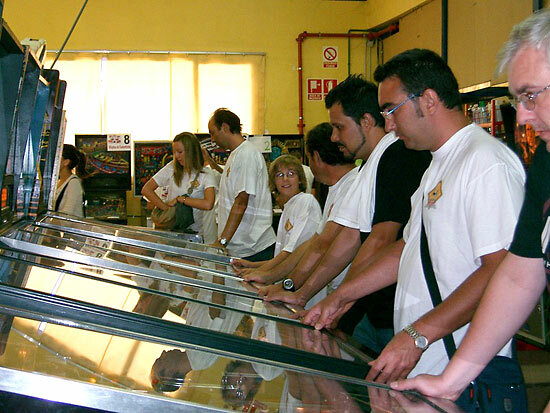 Inder, Playmatic, Petaco, Recreativos Franco... all these Spanish companies are well known to any Spanish pinball fan. Saturday was fully occupied with qualification rounds for both tournaments. In each one, the 12 top-scoring players advanced to the play-offs. 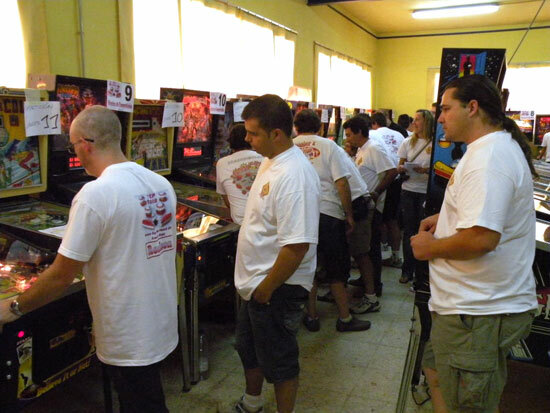 Saturday morning was dedicated to the Classic, while the afternoon was the time for the main tournament, contested on American DMD pinballs. After so much excitement, Saturday night was time to relax and enjoy a good dinner. It was also the moment for the organizers to choose and announce the pins for play-offs and finals. Sunday morning started with the Classics play-off. 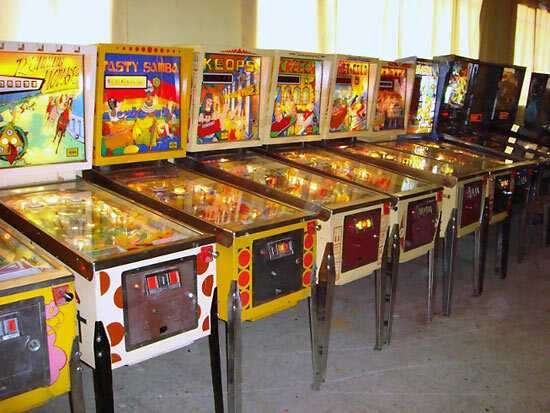 Four groups of three players had to play one game on three of these machines: Shamrock, Attack, Hot&Cold and Canasta 86. 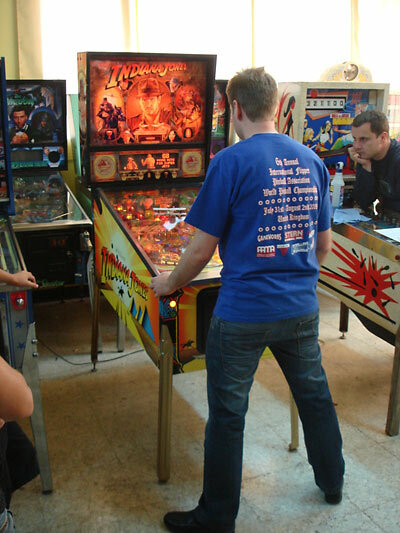 In every group the winner on each pinball received 5 points, 2 points were given to 2nd place and no points for the competitors with lower score. The player who achieved the most points would make it to the final. After dealing with the 3 pins and with the pressure, four players (one per group) qualified: Ángel Martínez, Carlos Vicente, Miguel Manzaneque and Rafael Benet. After the Classics semis were over, the Main Tournament semis started. The same system used for Classics was also adopted for this competition. More than an hour later, and after dealing with Scared Stiff, Black Rose, Medieval Madness and Lord of the Rings, the four winners had secured their places in the grand finale: Carlos García, Javier Bustamante, Basilio García and Juan Antonio Martín. Trophies awaited for their owners. They couldn't be better guarded! Alongside both play-offs there were also two side tournaments for those player who did not qualify. 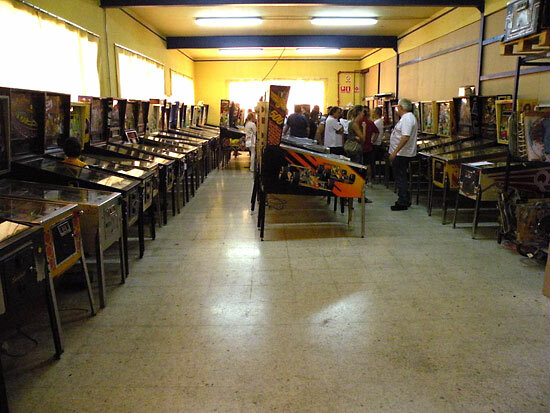 In addition, all the machines which weren't chosen for play-offs or finals passed to recreational play status, so there were plenty of pins for free playing. So once the contenders had been decided, it was time for the finals. 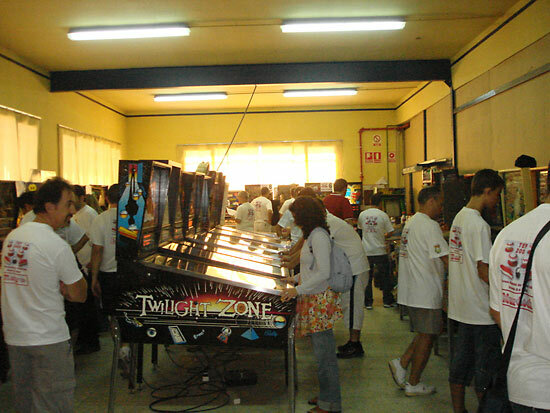 All the other machines were turned off and the audience gathered around (while giving the players enough room) the machine to be used for the Classics final. The chosen machine was a '300' from Maresa, a one player exact replica of Gottlieb's '300' but with one more digit in the scoreboard plus other minor (or not that minor) differences. 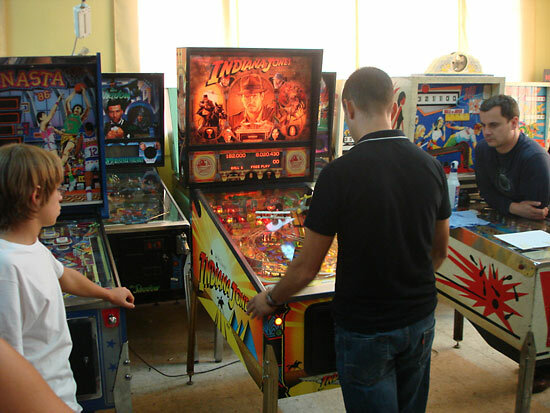 The final machines in both tournaments were set to 5 ball play. 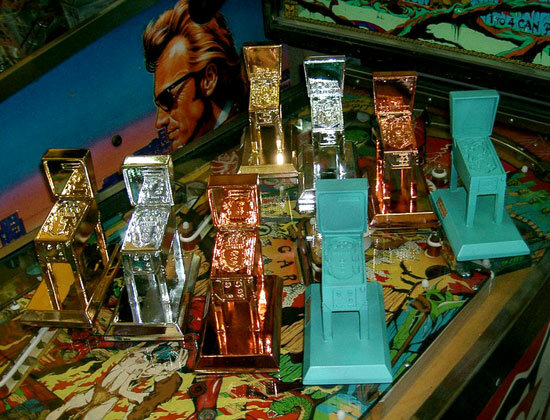 As it is a one player pinball, every contender played his whole game when it was his turn. 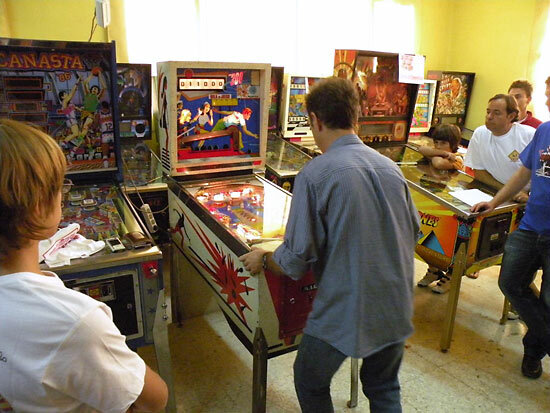 The first player was Rafael Benet, who recorded a nice score of 615,000 points. Then it was the turn of Miguel Manzaneque, who reached 431,000 points. Next it was Carlos Vicente who managed to achieve 354,900 points, and finally it was time for Angel Martínez to play, who scored 321,100. 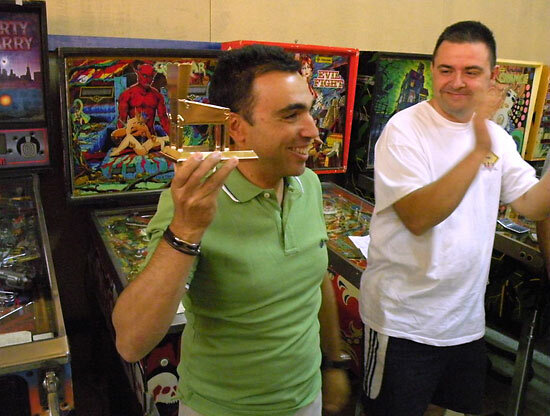 Therefore Rafael Benet distinguished himself as the new Classic pinball champion. And so we reached the most exciting moment of the whole weekend: the Main Tournament final. 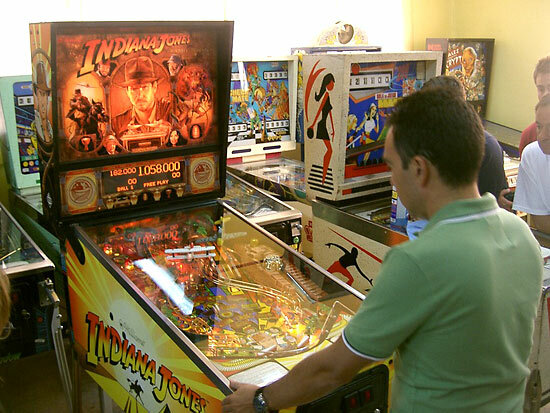 The chosen machine was a Williams 'Indiana Jones' also set to 5 balls on a four player game. Knowing that IJ could be a long game machine, the outlanes were adjusted open wide for shorter ball times. After the first ball, Basilio García took a nice advantage, going over 100M while his opponents couldn't reach half that score. Things continued more or less the same way for the first 3 balls, but while Basilio couldn't increase his score much, Carlos García was getting nearer and nearer. Meanwhile Juan Antonio Martín wasn't too far nor too near, and Javier Bustamante had bad luck with his game. The machine was being rather cruel to him. By the end of the fourth ball, Carlos had taken the lead after a decent ball while Basilio didn't have much luck with his. Juan Antonio kept going slow but firmly, although he was still some way behind the two leaders. And Javier suffered again from Indy's wrath with another best-forgotten ball. Fifth and final ball. No more mistakes can be made. It's the last chance. Unfortunately for him, Javier Bustamante had the same bad luck with his last ball. It's fair to say that he didn't have many chances and Indy behaved in a really mean way to him, so he finished in fourth place before his opponents started their last ball. Time for Juan Antonio, and one 'magic ball' appeared. He started several modes, a couple of 3 ball multiballs and also Super Jets gave him a nice amount of points. After a well played ball he was over 470M, more than 300M away from his two remaining opponents. Basilio didn't have a good last ball and got 3rd place. Carlos started his ball knowing he would finish in at least 2nd place. Could he also have another 'magic ball' and so retain his title? Well, not today. His final score was slightly over 180M, making Juan Antonio the new champion. There was only time for some clearing up and a few last photos before people started on their way back home. This year's TEP was over and the days started counting down to the next one in 2010. 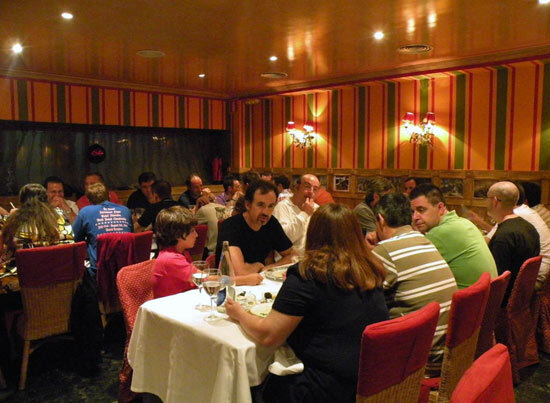 You can find more pictures, some videos and comments (in Spanish) in Petacos forum.